Once upon a time, Jess had a cow. Well, not like that. She really had a cow. Honest. 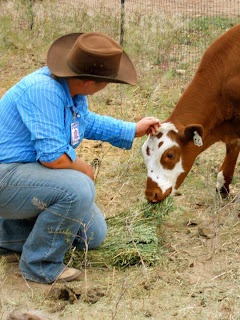 He was an adorable little Angus-cross steer calf with purple eyelashes*, and his name was Tauros. Tauros was shy. So shy, in fact, that he wouldn’t eat the food that Jess brought him until he was certain she wasn’t looking any more. Even if she just tried to sneak a peek over her shoulder from all the way at the other end of the pony barn, he would know it and he’d hightail it for the safety of his lean-to. But Jess has this thing–*cough* obsession–with earning the trust of skittish critters, and she wasn’t about to let a cow ruin her record. So every day at feeding time, she worked on getting gradually closer by moving slowly towards him until just before he ran away. There, she would stop, talk to him for a bit, then turn and leave him alone. If Jess thought it was a magical day when Tauros finally let her touch his nose–just the tiniest little bit–she had no idea how thrilling it would be when he was comfortable enough to let her pet his head and neck and shoulders. Or how fun it would be to hear him moo “Good morning!” at her, and walk up to her when she entered his pen. Just as it took me time to convince Tauros I am cool enough to hang out with, I think it’s important to remember that it’s okay to take our time with our writing. We can’t force progress, or it’ll just run away and hide. I’m not suggesting that you let it take forever. Sometimes stories are like my sheep: I gave up on ever getting them socialized years ago. Occasionally, we do have to learn to let go of stories that just aren’t working. But I think that sometimes we get so caught up in the rush to achieve our writing dreams that we push ourselves too hard. I know I certainly do. And maybe I am only speaking for myself here, but when I start focusing on how long it’s taking, it stops being fun. It becomes a chore. And honestly, writing is already hard enough without adding extra pressure. By all means, make goals. Goals are important. Goals get things done. But pay attention to your personal writing style and make goals that are realistic for you while you are still in control of the process. I know people who can finish a novel in a month or two and I honestly think they are super human, but I know that’s not how I work. So, if your story is not working at the moment, give it some time. Sweet talk it. Stroke its ego. Tell it how handsome it is. Leave it alone if you have to. It will still be there when you come back, and it’s more likely to work with you–rather than against you–if you let it take as much time as it needs. *I can’t make this stuff up. Tauros really has purple eyelashes.